On the road, you want to feel at home no matter where the road may take you. That’s why, when you are shopping for a new RV, you want to make sure that it checks off those boxes while still being at a price point that you can get behind. If luxury and utility are what you are looking for, the Arctic Wolf 5th wheel 2455DRL4 is certainly going to suit those needs and many others. 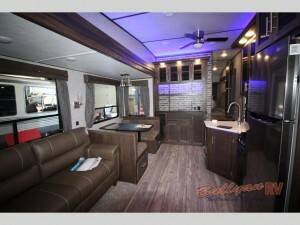 Here are just three things about the 255DRL4 5th wheel for sale that will make you feel right at home. It’s hard enough to feel at home when you are on the road, but you certainly don’t want to feel cramped. You won’t have this problem with the Arctic Wolf 255DRL4! With two slides that expand to give you more than enough interior space, you will be able to stretch your legs and then some no matter where you are on your journey. Feel comfy and cozy with the dark-wood interior design as well as tinted interior LED lights that will make you feel stylish and comfortable all at the same time. Beautiful furniture and seating areas as well as a well-lit kitchen and dining room area makes the Arctic Wolf Fifth Wheel 255DRL4 a real home-away-from-home. #3 – Kitchen, Kitchen, Kitchen! It’s so hard to feel at home when you are working in a strange kitchen or a kitchen that is too small. This isn’t a problem that you will have when you go with the Arctic Wolf Fifth Wheel 255DRL4. With a spacious kitchen complete with extra counter space, a high-rise faucet, a residential fridge, and three-burner range, you will be able to cook gourmet whether you are on the road, at the campground, or just in transit. There are so many great features to get excited about when it comes to the Arctic Wolf 5th wheel 2455DRL4; and all of them are certain to make you feel right at home, even if you are miles away. We carry many other awesome Arctic Wolf floorplans, so you will always have exactly the right model when you are shopping at Bullyan RV Center. Contact us at Bullyan if you want to make an offer or have any questions about these awesome 5th wheels.